Pokemon fans, rejoice, for parts of your childhoods have been animated! Pokemon has thrived for over 20 years now, and with those 20 years, its main gaming series has seen a plethora of installments, resulting in what we like to call: generations, hence the title. 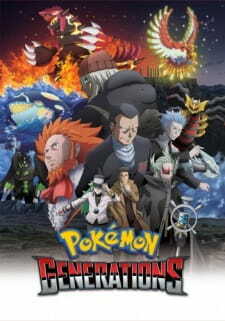 At the time the anime debuted (September, not December, like MAL claims), there were 6 generations of Pokemon, and this anime was created not just to hype us all up for Gen 7, which would come out 2 months later, but to celebrate all the memories we had within the past 20 years this franchise has lived. So, did this short episode anime series take us down a grand trip on memory lane? Let's find out, shall we? You might find it fruitless to judge an anime like this based on story but here me out. Each of the 18 episodes present within the series isn't connected to one another. They are all just 3 highlight moments in every generation, leading to this pattern of 3 per generation. However, for the first 6 episodes, the pacing is terrible. They often feel way to disjointed and rushed, with episode 4 being the prime example. Luckily, the pacing for most part improves heavily, and it adapts some of the more powerful moments from generations 3-6. It honestly makes me want to see these moments get expanded upon in possible full-fledged anime adaptations of each of the generations (the main anime doesn't count). What this comes down to is how well each character from the games was adapted, and here, they did an inconsistent job, which, given that some of these guys were lame in the games, makes this feel like "damned if you do, damned if you don't". Still some of the characters, namely Cynthia and Courtney, weren't adapted accurately, and it shows in some cases. Luckily, characters like Looker, N, and many others were adapted very well, and characters like Iris and Ghetsis were improved! They luckily kept their story arcs too. OLM is mainly known for their work on all Pokemon anime, and they did a good job here for the most part. unfortunately, the art can be inconsistent at times, especially in episode 4, and the separate lines that are used to represent lips are far too separate. Still, the second half steps up the animation a bit from the first half, but overall, it's all good. I especially love the style used for the story in the final episode, and the action is done decently as well. The OST is comprised of remixes of some of the OSTs of the games, but they aren't all that memorable here, especially since they didn't take from the more memorable OSTs of the games. As for the dubs, it's rather mixed. Some of the voices (like that for Courtney, Maxie, and Cyrus) really do not fit at all, but then we get some good ones, especially Patrick Seitz as Ghetsis. Then we have a bunch of decent ones. It is certainly a mixed dub, as I said. The first 7 episodes are relatively interesting, but it really picks up in episode 8, where a lot of the more exciting plot points of the games get adapted. Episodes 13-15 are especially fun and epic...for Pokemon standards, anyway. Plus, it's still sort of satisfying, seeing some of the highlights of some of my childhood Pokemon experiences being animated, especially when the second half shows the more dramatic story bits from the games. Honestly, there isn't much left to say that I haven't said. It's fun to see some big moments from the games animated for us in celebration of 20 years of absolute glory. It's relatively harmless at worst, and really satisfying at best. It celebrates the franchise, and it makes me glad to be a Pokemon fan. Well, with all that said, I bid you adieu. TL;DR: If you are a fan of the Pokemon Games then watch this to revisit those timeless moments for nostalgia explosions! Pokemon Generations is an ONA that pays homage to all the fans that played the Pokemon games in the last 20 years. From the black and white days of Kanto region to the bright colour 3D days of Kalos region, the anime captures a quintessential moment from each of the video game. The story isn't simple nor complex, they are just clips from the game accentuated to new heights. Though the episodes aren't connected to one another, together delivers the nostalgic explosions. Although the first few episode's pacing will leave you feeling disjointed but later on the pacing improves to establish a good satisfying ending. This anime doesn't have any plot holes nor any unexpected twists or turns since it's just moments from the game reanimated. However, the villains and the legendary pokemons really stand out in this series. It could be the nostalgia factor of seeing the video game characters coming to life but the voice actors for both the dub and sub should receive the real credit for making them this fleshed out. To be fair, for an ONA, this show really stands out in terms of its Art and Sound. The artists use of hand-drawn animation in the first few episodes to blended CGI for the latter part of the show highlights how the game franchise evolved over the 20 years. This transition aspect makes it memorable for the viewers. Despite all, the pokemon battle animations were not blended well but one must keep in mind this is also not from a big budget studio. Regardless, most of the drawings of the characters reflected well from the game and each character did stand out in their own way. Moreover, what the ONA lacked in the art department, it made itself up in the sound department. The show doesn't have an OP & ED song but the beginning of the first episode with the classic opening sequence from the first original handheld game really evokes all the nostalgia from the childhood. Each subsequent episode the sound director made improvements upon that initial opening songs to showcase its 20 years journey. Though I won't listen to the OP/ED song again but for an one time experience it's good, nothing great. Overall, Pokemon Generations is a good standalone ONA. Its purpose was to evoke nostalgia and show how far this gaming franchise came in the last 20 years and it did just that. Surely fans of the franchise will only see the positives, however there were few negative aspects, such as disjointed pacing, improper animation blending and falling short in the background score. Regardless, if you want to spend an hour just reliving your childhood memories with endless nostalgia, definitely hit up this anime for a one-night stand sort of experience. P.S. Thank you for reading my review. I'm always open to criticism and suggestions. I hope you found this short but supaishi review helpful. 2016 was a great year for Pokemon. As for the games, we got Pokemon Sun and Moon which improved on Pokemon's transition to full 3D. We also got Pokemon GO, a mobile game which became one of the most popular and unique mobile games, and as for anime, we got this, Pokemon Generations. To me, this is what the Pokemon anime should've always been. So many things I disliked about the anime are either gone completely or have been improved on. Firstly, Pokemon Generations stays almost absolutely true to the stories of the games. The series also doesn't focus on the protagonist, but focuses on a single character, usually in a scenario which is occurring at the same time within the game, which gives a new perspective and builds upon the lore of the games. The animation and art style is good, and definitely an improvement from the anime. I always thought the animation in the anime was very lackluster. However, in Generations, I did not see any faults. This is especially noticeable in battle sequences. The battles seem a lot more believable and less "cartoony", which suits this adaptation's darker direction. The series does make the occasional mistake of using too many extreme close up shots during battles, but it wasn't enough to make me dislike this series. The sound is absolutely brilliant, and one of the best things about Generations. There is some original soundtrack, but also uses music from the games where it is necessary, usually in an orchestral arrangement. They did an amazing job of staying true to the game music and not have the dialogue and the rest of the sound drown it out. The sound in Pokemon battles is also great, with many interesting sounds and avoiding reusing the same explosion sounds over and over (which was a huge problem with the anime). The Pokemon themselves also sound different, and do not say their names anymore and sound much more like monsters. Something as simple as this was a HUGE thing for me and surely for many others, as this change definitely suits the more serious tone Generations was going for. I didn't have any complaints about the English dub either. Sure, some voices didn't suit some characters completely, but overall I think they did the best they could have here, and it did not spoil my enjoyment of the series at all. Overall, this is a fantastic series for true Pokemon fans, and it is very clear that this was made "for the fans". Many people, myself included, have wanted a darker, more serious anime adaptation of the games for a long time. 3 years ago, we got Origins, which was also a good series which stayed true to its source material, but Generations takes this even further, and spans from the first games up until X and Y. My only real complaint with Generations is the length, at only 4 or so minutes per episode. However, despite this, this is the best anime adaptation we are going to get of the games, unless a full length series is decided to be made. In fact, I was so lost in this series that I forgot completely about the length of the episodes, and truly believed I was watching a real Pokemon anime. And for that, I have to thank Pokemon for making me and many other fans happy. This bite sized series is pretty enjoyable even if you haven't played the games, or if you want to watch for the nostalgia and some spicing up. The biggest complaint however I can make about this series - although to be honest it's probably purposeful; is that at times it can slightly feel that it's only for the eyes of those who have played the core series games that are gone over. The soundtrack is based off of the games and a bit remixed, however it doesn't particularly stand out a lot except for a few instants. Nonetheless it's nice and enjoyable and serves its purpose. The animation isn't all too new as far as anime styles go, but nonetheless it is wonderful; as well as the voice casting! The fluidity of the style is nice and crisp, the color schemes are great eye candy and the lighting and angles are splendid. The action scenes tend to take on a slightly different style, but one that fits perfectly with the main and is fabulously explosive. In general everything is done well - the presentation of the story and characters, the visuals and sound, etc. It can hit you in the feels in various ways - overall it's a great show and does have an exciting "feel good" essence, and that great Pokémon essence too. However some episodes are a tad dull, and mentioned feeling does lower the quality of how the content is presented. Despite this, like many others, I still kinda wish it wasn't over or at least each episode was a bit longer, or wilder yet, it was an actual full length show.